The Christine behind Christine Lingerie has been designing silk loungewear, lingerie and beautiful bridal pieces for over 40 years. More over, she lives and breathes her brand, incorporating her silk and velvet designs into her daily wardrobe. As both intimates and outerwear, here are her five favorite silk loungewear pieces that she wears to feel beautiful, comfortable and chic. A Long Velvet Robe: “I love waking up in the morning and putting on my long velvet robe.” Christine says. She prefers them oversized so that she can cuddle up in them to feel cozy on cold mornings. Christine likes that you can also wear them in the evenings and still feel elegant while sitting around and watching TV. Velvet is something we like to incorporate into our collection every season. This season we chose a beautiful black cherry color for our Faberge Long Velvet Robe, making it a timeless and most glamorous way to feel cozy in the mornings and at night. A Silk Kimono: Every season, we design a new, exclusive print for our Japanese-inspired collection. Christine loves an open silk kimono so much that she chose to wear it to BOTH of her daughter’s weddings paired with a coordinating silk cami and lounge pant from our collection. When talking about her love for the bi-annual Japanese-inspired kimono Christine says, “When you wear one of our silk kimonos you are wearing a work of art. I wear them to many events, fashion shows and parties and people always compliment on how beautiful they are. Each season, we work very hard on our print to develop a new unique look. 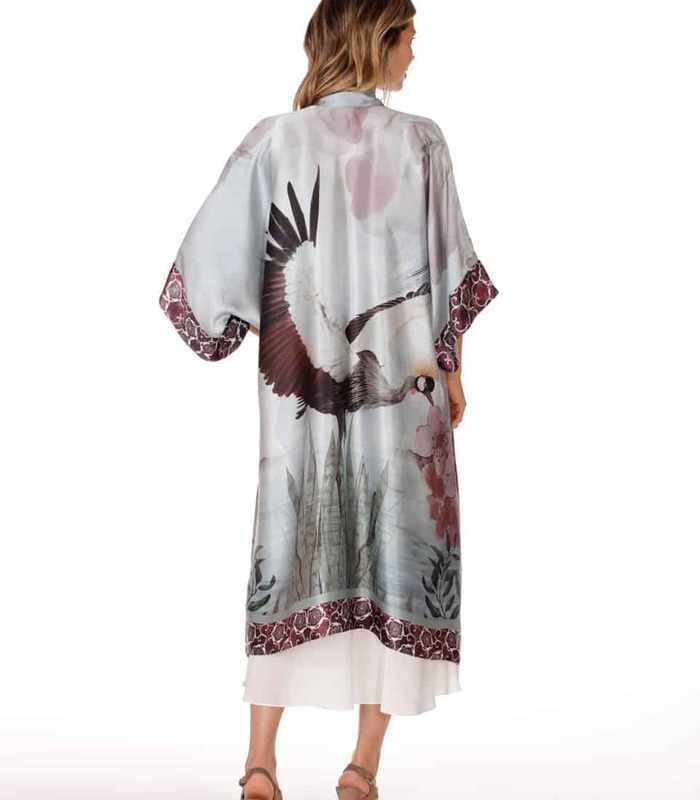 With our Japanese-inspired prints, it has always been an incredibly creative design process to put the collection together.” For Spring/Summer 2019, we premiered the Solitude Collection, which includes a beautiful new silk kimono depicting a graceful crane and floral motif. This work of art is perfect if you are looking for a refreshing, cooler hue. 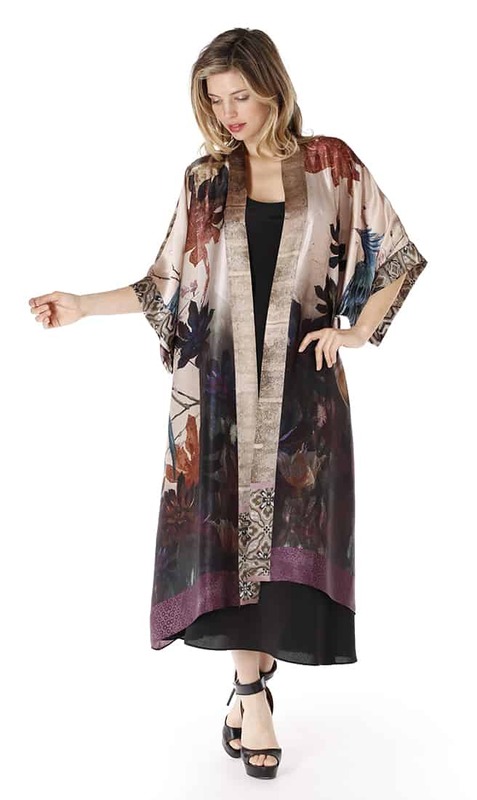 If you would prefer darker earth tones, we suggest the kimono from our Phoenix Collection, which is among our most striking kimonos to date. The blue phoenix on this piece is unforgettably magnificent. Silk Tops & Tunics: “These are everyday pieces that I feel comfortable to wear to work or out for dinner.” The best part of our silk tunics and tops is their amazing versatility. They are designed to go beautifully with jeans or silk pants. You can dress them up, wear them in a corporate environment or dress them down and casual. Lastly Christine adds, “I love taking the tunics to Mexico and wearing them as a coverup over my swimsuit.” So it’s safe to say that these pieces are an extraordinary value in addition to being a wearable work of art! A Classic Cami and Lounge Pant: From the designer herself, “These are so easy to slip in to. Again, you can dress them up or down and they are flattering for all body types.” Christine loves wearing a silk cami and lounge pant set to present her new collection at our booth at the CurvExpo in New York City each season. As she mentioned earlier, they pair so elegantly with the open kimonos. Christine additionally enjoys pairing the silk cami with jeans or pants. “I keep them in my wardrobe in every color.” she says. Silk Pajamas: These are a timeless classic and a staple to Christine Lingerie. In the evenings, Christine loves to wear silk pjs to watch her favorite shows with her husband, David. She even likes to style the button down top as a shirt to wear for a casual date night with her love, too. Our silk pajamas come in a variety of colors, which you can see by clicking here, or shop some of our favorites for SS19 below! CLASSIC PJ – AVAILABLE IN MULTIPLE COLORS!